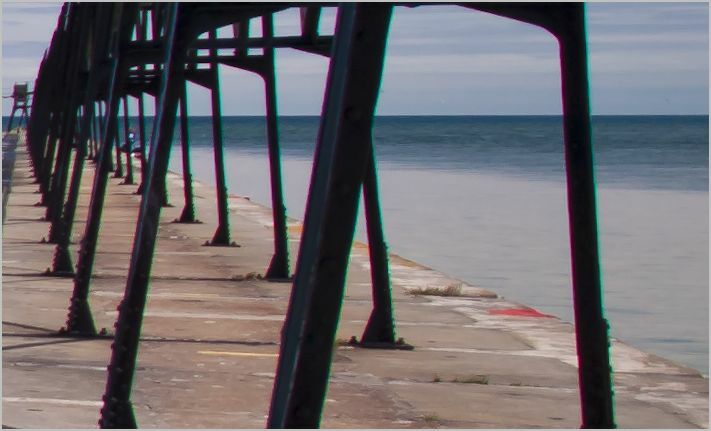 Chromatic aberration (purple fringe or other color anomalies around bright to dark transitions) is an annoying thing in photos and can easily sneak into one of your’s! You can see it in the photo I have here around the dark legs of this structure. It is the magenta lining on the left and the aqua on the right of each of the legs. Click on the photo to see it larger if needed. You may miss it the first time looking at the photo because you’re interested in the composition or overall color, sharpness, etc. (as you should be). But, looking closely, you will find it in almost all of the photos you take. It is sometimes an aqua, magenta, blue, or yellow lining of darker objects on lighter backgrounds. In older cameras, it was purple, giving it the nickname of “purple fringe.” Fortunately, in Lightroom, there are two or three ways to get rid of this annoying item. Use the Lens Corrections panel. This is an easy one and usually will take care of the issue for the lens and camera you are using. The advantage here is that someone has profiled the lens you used (hopefully it shows up in the listing under make, model, or profile), and they have determined the best way to remove the chromatic aberration (“C Aberration” slider in Lightroom3). If you can still see some aberrations, try moving the “C Aberration” slider around in Lightroom 3 and earlier versions. 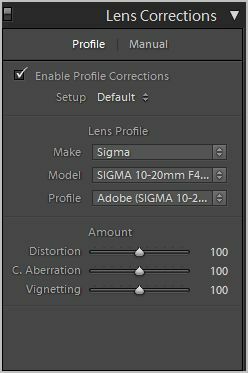 In Lightroom 4, clicking the “remove chromatic aberration” check box will usually do the trick, and there are no sliders to adjust. 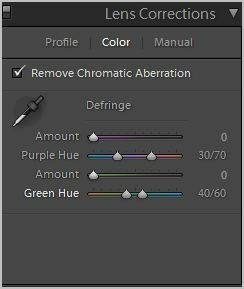 Use the HSL (Hue Saturation Luminance) panel, and remove the color by reducing the saturation for that particular color of aberration. This is not always possible though because if that color is anywhere else in the photo, the color will also drop out there. But, if for example you have a beach scene that usually will never have any magenta in it, and you have a magenta aberration around some object, then it will work, because that is the only place the magenta shows up and removing it by decreasing the saturation in the magenta channel will not harm the rest of your photo because there is no magenta anywhere else. Make a “Chromatic Aberration Remover” brush. It’s easy. 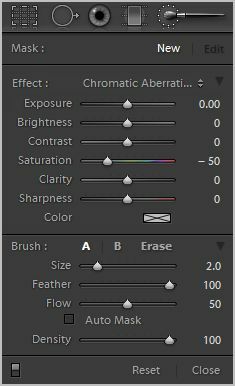 Here’s how: Use the adjustment brush panel and make a brush that has a saturation of -50 to -100, size of about 2 or 3, feather at 100, flow at 50, no auto mask, and density of 70-100. Now just go in and paint away the aberration! This works best if you’ve tried the others first. Get the most out of the Lens Corrections panel first, then if the HSL trick doesn’t work, go with this. Sometimes the Lens Corrections panel will not give you all you need, then following it up with this works very well. Be careful though, you can remove too much color and leave a line of no color where the chromatic aberration was. This is obvious too, so try to avoid it. These are just some of the ways I effectively remove chromatic aberration from my photos. They work and are relatively easy to do while making a big impact on the finished product! Click here to see the final image with the chromatic aberration corrected.